If I be not disappointed, I hope to see you within two months, or little more. I thought to have seen you before now, but some affairs of the university have delayed my journey for some weeks. ... take notice of the fabrick and forme of the most competent observatorye, that ours here intended may be builded with al its advantages. considering the intended work to be of such moment and expenss that we ar not able to accomplish it with the contributions of these only who have already listed themselves encouragers of it; Therefore We also by these presents do nominat and constitute the said Mr James Gregory our factor and special mandator for making application unto all whom he knows to be favourers of learning, for their concurrence unto the advancement of the forsaid work, with full power to do every thing proper and requisite in this affair, as others formerly imployed therein have bene empowered by us to do. Gregory went to London soon after receiving the commission for by July 1673 he was corresponding with John Flamsteed with letters written from London. In this letter, Gregory describes in great detail the construction of his new observatory. However, there is some confusion about what he is actually describing. Turnbull, although realising that there are some problems with the identification, believes that Gregory is describing converting the King James Library into an Observatory. Turnbull's suggestions about Gregory's observatory are at THIS LINK. However, with due respect to Turnbull, this does not seem a very sensible suggestion. There are two obvious points which don't match Turnbull's suggestion: Gregory is describing a three storey building, yet the King James Library only has two storeys, and Gregory says that the rest of the college is between it and the north, but the King James Library in on the north side of the college. But there are other objections to Turnbull's claim. If the university proposed converting the library into an observatory where will the library be? Why would they build a new library and convert the existing one to an observatory rather than build a new observatory? There is certainly no evidence in university papers that they were contemplating building a new library. We know that an observatory was built at the bottom of Westburn Lane to the south of the college. There is considerable documentary evidence (from 1677 onwards) that a, partially completed, observatory existed at this location. If Gregory's plan was to convert the library why did the university build a new observatory at the bottom of Westburn Lane after Gregory left? The only logical conclusion is that Gregory is describing the building at the bottom of Westburn Lane which we know was a partially built observatory a few years after he left St Andrews. If we are correct in this assumption, then an existing building was being converted into an observatory rather than being built from scratch. The building was outside the College grounds and didn't belong to the College. What was this building? If a large house, then would the whole 3rd storey have been a hall as Gregory describes? That it is aligned with the library and the rest of the College is not totally surprising (the 9 or 10 degrees to the meridian that Gregory describes). That it should have the same breadth as the library may be slightly more surprising - but not exceptionally so. It does have three windows in each storey to the south - Gregory says two windows on each side. Also he says "the walls of our Observatory being already built in the top of one of our Colleges". Could "in the top" mean "to the south" rather than "to the north"? 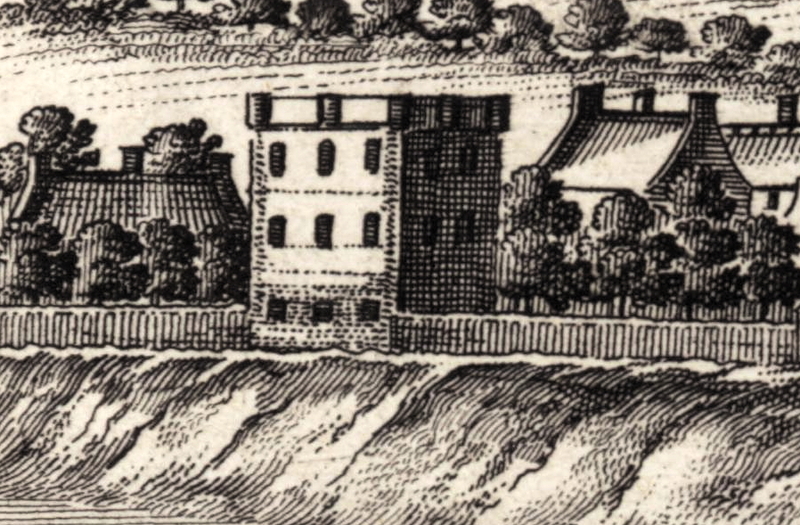 Gregory erected a commodious Observatory for mathematical observations in the College-Garden of St Mary's College, having caused a contribution to be made for that purpose. He also furnished it with many mathematical instruments much better than it had been before his time. It were tedious to write down particularlie all the instruments I have brought home, yea a larger letter wold not contein all ther names and sizes, for I have all sort: our largest quadrant is of oak, covered with brasse, 4 foot in radius and actually divided in minutes, of which we can judge 1/3 or 1/4: we have two semisextans, all of brasse, 6 foot in radius, diagonally divided, in which wee can judge 1/6 or 1/7 of a minut. Our largest telescope is 24 foot longe; which magnifys one dimension of the object 100 times. ... As for observations or experiments, I dar hardlie promise anie considerable befor the observatorie be builded: seeing (whill the instruments ar keeped in the bibliotheck, wher I cannot be alon or with my own companie and conveniencie) it is hard if it be at all practicable to doe anie thing seriouslie and with exactnes. The latitude here is 56 22'. The declination of the needle is 3 35' westward. It is so long since I had the honour to hear from you, that I am apt to imagine that I have the misfortune to be forgot by you. I remember I wrote to you several months ago, and some time after my arrival here in Paris; but have never since heard, either of, or from you. You cannot believe the greatness of the impatience which all the virtuosi here are in to hear of the progress you have made with your Observatory in Scotland. None hath more longing desires to be informed of the particular description of it than your good friends Monsieur Justell and Monsieur Cassini, who often discover their great respects for you, and promise themselves some considerable achievements in the mathematics from you. They long much here to know what your observations have been concerning the last eclipse of the moon, which happened some months ago. I received, some days ago, your very obliging letter, and, not long after your arrival in Paris, I had a letter from you; to which, the truth is, I was ashamed to answer, the affairs of the Observatory in St Andrews were in such a bad condition; the reason of which was a prejudice which the masters of the University did take against mathematics because some of their scholars, finding their courses and dictats opposed by what they had studied in mathematics, did mock their masters, and deride some of them publicly. After this the servants of the Colleges got orders not to wait on me at my observations; my salary was also kept back from me; and scholars of most eminent rank were violently kept from me, contrary to their own and their parents' wills, the masters persuading them that their brains were not able to endure it. These and many other discouragements obliged me to accept a call here to the College of Edinburgh where my salary is near double and my encouragements otherwise much greater. Yours of July 13th, I had the favour to receive this week. I rejoice extremely to hear of your welfare, and that you are now settled in a place where you have the opportunity of communicating to the world some of those rare productions which all persons of the learnedest size do attend from you with no small impatience. ... All your worthy friends here are extremely well pleased to hear of your welfare, and long to have an account of your Observatory, from which they promise themselves great things. I am heartily sorry there is so little appearance of its being suddenly erected which I wonder at, when I consider how free and willing many of the nobility and gentry have been in contributing towards providing necessary instruments. ... I would willingly know when you were transplanted from St Andrews to Edinburgh, if you have removed all the instruments also, and carried them with you, or if they lie still there as appertaining to that University. As I can understand, ye Mathematical Observatory built for Gregory ... was never compleated, as he left 'em. ... the lower windows of the Observatory, being all open, children have access to go in to it, and are in danger of being hurt, by reason of the rottenness of the floors. It is likely that the lack of action resulted from the fact that the partially built Observatory was not part of any of the three Colleges, so it would not have been clear who should pay for the work. In fact this was discussed and it was agreed at this time that it would be paid for equally by the three Colleges. 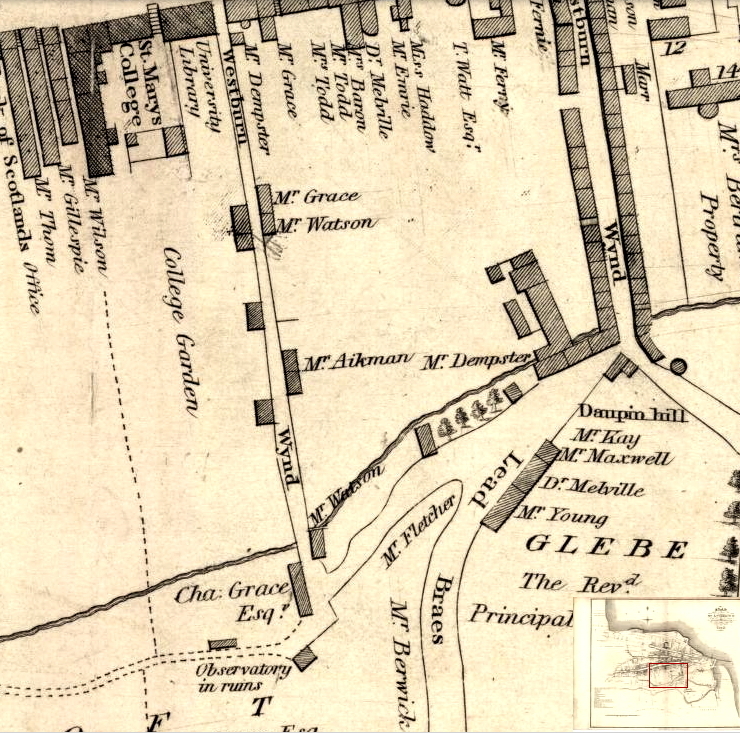 In November 1736 the University sold off lead and timber from the Observatory and, in 1761, it took down the remaining unsafe walls. Something must have survived, however, since "Observatory in ruins" still appears on maps of the town in 1820.